Privilege Card member entitle up to 10% saving. This online shopping store is special design for our privilege card member only. Provide free delivery to the area that we are cover. Ever wondered why you had to leave your office to get your documents printed? Now you don't have to! Copytex's Online Printing can take your digital files from anywhere you are with an internet connection. With the introduction of the XEROX DocuColor 4CP copier into Copytex's color laser copying arsenal, we are now able to offer faster, same-day service with economical pricing, making short to medium runs of full-color copying and affordable printing. The XEROX DC4CP full-color digital copier produces consistent, faster outstanding color printing from digital files or an original copy off the glass. If you're planning a full-color offset print run, consider the quantity and quality advantages of this print-on-demand system. Quantity can be adjusted to suit your immediate needs, and avoid carrying extra inventory of printed materials. And a single DC4CP color proof can tell you immediately what to expect. Either way, you'll find DC4CP technology takes color accuracy and brilliance to new heights. The DC4CP can print on paper weight from 60 to 220 gsm, as well as transparencies, so it's ideal for jobs you wouldn't normally consider for color quality, including: covers, real estate ads, product displays, architectural and interior site plans, transparencies, brochures, flyers, menus, newsletters, business cards, posters, invitations, greeting cards, name tags, labels, promotional rack cards and 3-D promotional displays. Output can be generated from color originals or digital files in a variety of formats. Single or double sided copies. 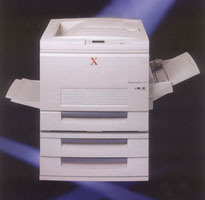 Competitive pricing makes the XEROX DC4CP a sensible choice for runs of 1 to 1,000 pieces. Copying sizes from A4 (210x297mm) to A3 (297x420mm). Reduction and enlargement capability ranges from 50% to 200%. Color consistency is ensured on every copy. The XEROX DC4CP uses an advanced imaging system and small-diameter toner (6microns) to produce colors faithfully and consistently day in and day out.